There shall come a time when all the while You either strike Small Winning in Permutation Top 3 Prize or miss by just 1 number on any of the the TOP 3 Prizes... and then suddenly there is total miss on all of TOP 3 Prizes, and the same situation happens again and again that drag for 1 week to 1 month and beyond. 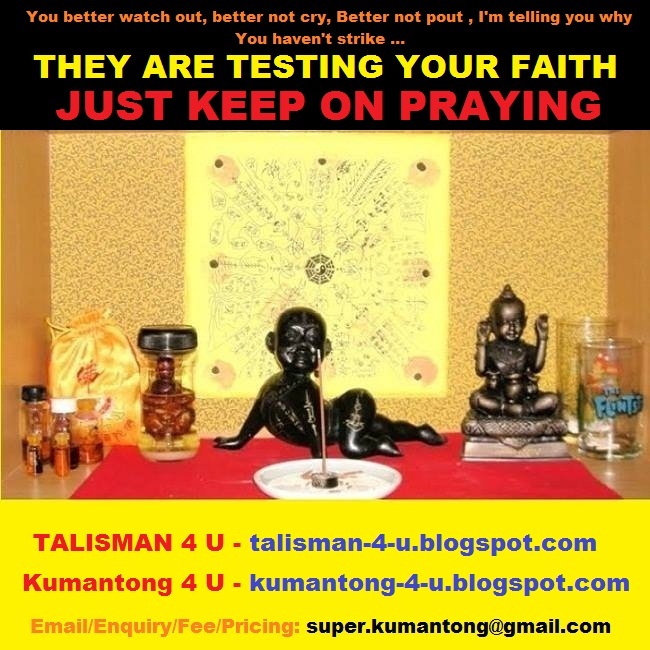 You start to panic..
You suspect that the Child Spirit has disappeared from the Kumantong Statue / Mini oil Bottle / Amulet..
You need not worry, the Child Spirit is still in the the Kumantong Statue / Mini oil Bottle / Amulet. This is the scenario that You must be very alert. Kumantong is preparing to give You a Super Big Winning in Lottery Strike anytime soon..... but... with some conditions met. Kumantong is testing whether You can be affected emotionally from winning or losing in the Lottery. Kumantong expects You to be able to "Keep Calm" regardless whether You strike Lottery or not. In Chinese, it is called: 平常心 （Ping Chang Xing). Kumantong will train and prepare You by purposely provide 4D Numbers that will Totally Missed and then, until You can show You are not emotionally affected by the outcome of results, then will Kumantong let You strike Big Lottery Prize. There is a Chinese Saying: 求财心别急，时到花自开 ( Qiu Cai Xin Bie Ji, Shi Dao Hua Zi Kai). Translate Into English: When seeking Lottery Strike, do not be anxious. When the time is right, the flowers will blossom by themselves. With a sudden Financial Windfall, Some people will have sudden character change for the worse after receiving tons of money. Kumantong will make sure You won't turn to an arrogant, stuck-up idiot after You receive a huge financial windfall through Lottery Winning. You can visualize what You will do with the Money and What kind of person You will become once You received few ten thousands / hundred thousands or millions from the Lottery Winning. Using the money from Lottery Strike to seek revenge on the people who use to bully/look down on You is OK and also remember to repay the good deeds to the people who give You helping hands when You are down and out. Kumantong understand the potential problems people will face when they receive a sudden huge financial windfall. Kumantongs have their way to train, test and prepare You mentally and emotionally and keep Your Character In Check before letting You Strike Lottery Big Time again and again non-stop. If You feel You have been a good person and always treat family members and friends generously and not a stingy,self-fish,cheapskate, then keeping Kumantong will definitely help You in Striking Lottery non-stop. Individuals who already have lots of money (They are already good in managing money) and a good character ( They won't use money to harm, bully people or act stuck up and be arrogant), have been doing good deeds to the poor and charities, filial to parents and always generous towards friends are the type of people that will always strike Lottery Big Time non-stop from Kumantong 4D Method. Ironically, these folks are not interested in Kumantongs and not interested in betting on Lottery because they already have lots of money. Kumantongs are holy version of Child Ghosts , having the rank equivalent to Heavenly Angels. They have the duty to make sure their owners and worshipers are mentally and emotionally prepared and kind-hearted before they receive huge financial windfall through Lottery Winning. In order to just Strike The Lottery Big Time, without the interference of having to "Be Good Person", the only way is to seek help from Ghosts / Spirits in the Graveyards or Banana Tree Spirits or any other Spirits in the wild. The "Payback" might be burning of certain amount of Joss papers to the ghost or do a rebirth ritual for the ghost etc. You need the service of a Spiritual Master or able to invoke Ghosts/ Spirits Yourself. You will have to negotiate the terms with the Ghosts/ Spirits and make sure You pay back exactly what You promised after Your wish of Striking Lottery is answered by the Ghost. If not, You will be dead . Kumantong need not negotiate terms when You seek Lottery Numbers from them. If they want You to strike, You will strike. If they don't want You to strike, You won't strike. Kumantong 4D Prediction Method is still the safest. Keep Your Emotion In Check. Win or Lose doesn't matter. Peaceful Heart and Mind. Personal Character In Check. Make sure You won't turn to a Bad Person after You strike the Big Lottery Prize. Never been a Stingy, Self-fish, Cheapskate. Make sure You have been generous towards family and friends all the while. With these 3 conditions met, Kumantong will keep letting You strike 4D Big or Small Prize non-stop.